He’s a (not-so)-Lean, Green Reading Machine! Meet Glummy. 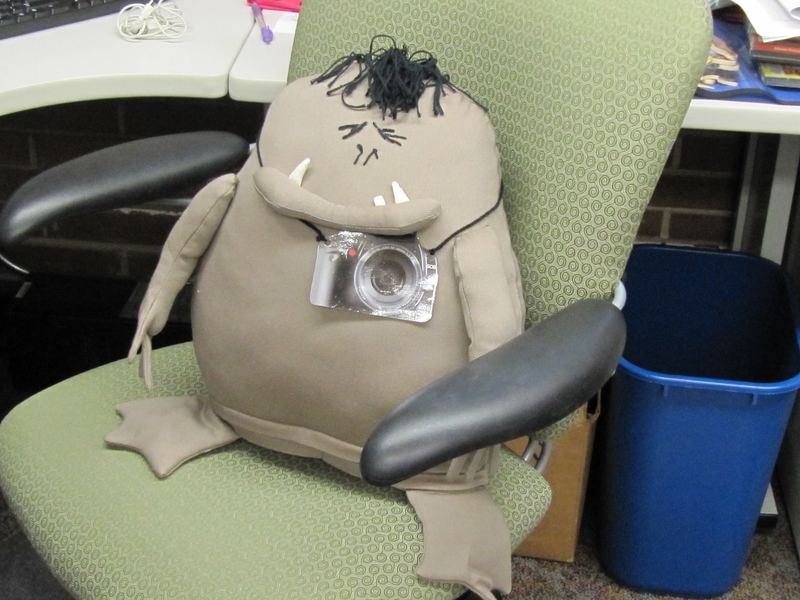 He’s the official mascot of Summer Reading in our department. Glummy in the Plush! This huggable Glummy was made by Tasneem R., one of our wonderful volunteers (who happens to be an expert tailor). Whenever SRC starts to fray my nerves, a Glummy hug recharges my batteries faster than you can say, "weird little booger-man"
He’s been around a lot longer than I have (about 5-8 yrs). The game generally revolves around Glummy’s latest adventure (or misadventure as the case may be). My husband says he looks like a booger (in a good way!) I lllooooooovvvveeee him! We all love him! The kids really love him. Every time I go in for school visits to promote SRC I take a big picture of him (his outfit always fits the SRC theme). The kids go bananas every time! Last year a kid spotted Glummy before I even crossed the threshold. He jumped out of his seat, knocked over his desk, shouting, “I KNOW THAT MAN!! I KNOW THAT MAN!!!!! !” For a nano-second I thought he was talking about me. I’m not a particularly mannish lady, but as you can see it’s quite a stretch to call Glummy a man. This year in honor of One World, Many Stories he’s going an a trip around the world. Check out my SRC post from yesterday to see our game. Our patrons are traveling far and wide this summer–I’ve heard the Wisconsin Dells, India, Kenya, and Panama Beach just to name a few. Ms. Debbie Graham (a librarian of the highest caliber) developed a program that knocked my socks off: Take Glummy Around the World. He’s a stowaway, that rascal! 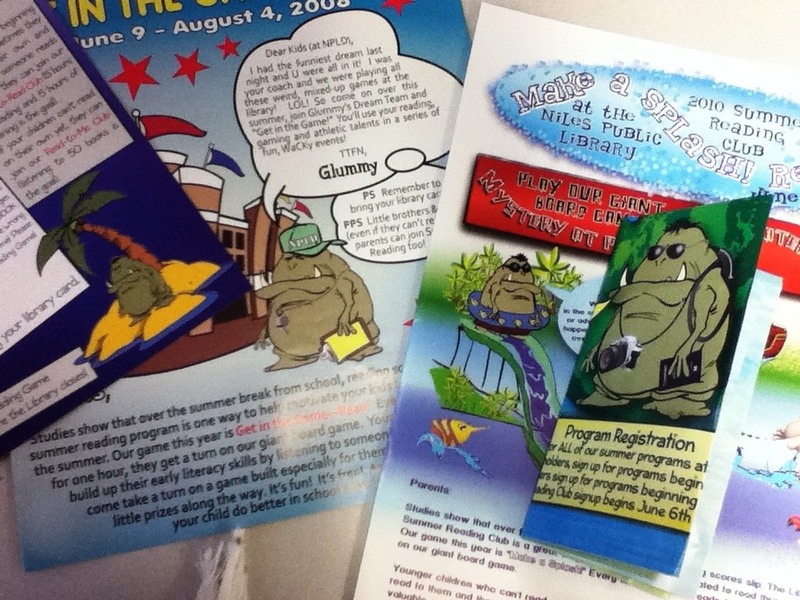 We had about 25 pictures of Glummy printed and laminated. They’re about a 1.25′ x 0.75′–small enough to fit in a small poster tube. Kids can come into the library him up before they leave town. Then, whenever they take snapshots, they can pull out Glummy and take a picture. At the end of the summer we’re going to collect the photos and display them online and in the library. I think we’ve signed out at about 20 of these “Flat Glummys” so far. I can’t wait to see the photos that come back! Kids love him (adults do to) despite his dismal appearence, he’s a party animal. I guess you could use an ugly term: “brand loyalty”. He inspires us. He’s a great jumping off point in the early planning stage. He provides just enough structure to give us the freedom to make a great story out of anything the Collaborative Summer Reading Program throws at us. Each year, his story gets more elaborate. He’s versatile. Personally, I like that he isn’t human or any recognizable animal, for that matter. He’s this weird little booger man, and he’s up for anything! So Bon Voyage Glummy! Send us a postcard!